The Colombian military says it has killed one of the leaders of a faction of Farc rebels who have refused to abide by the peace process. Rodrigo Cadete, 52, died in an operation in the southern Caqueta region along with nine other militants. 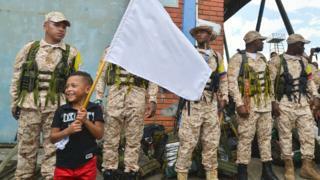 Colombian Defence Minister Guillermo Botero said Cadete had been trying to unite some of the 1,700 members of the Farc who have not handed in their arms. Most are now operating in remote jungle areas, fighting other armed groups. The overwhelming majority of the Farc are honouring the 2016 peace agreement that ended decades of armed conflict. Rodrigo Cadete took part in the peace negotiations held for nearly four years in the Cuban capital, Havana, but refused to accept the deal. He was considered second in command in the main group of dissidents led by Gentil Duarte, who was expelled by Farc in 2016 for refusing to demobilise. "Today in a seamless operation the criminal known as Rodrigo Cadete, one of the most feared figures of terrorism in our country, was neutralised," President Ivan Duque said at an event in the city of Manizales. Mr Botero said fighting was continuing in the region. The Farc, or Revolutionary Armed Forces of Colombia, is now a political party known as the Revolutionary Alternative Common Force with five seats in the Senate and five in the House of Representatives. The Farc was formed in 1964 with the stated intention of overthrowing the government and installing a Marxist regime. Their main founders were small farmers and land workers who had banded together to fight against the staggering levels of inequality in Colombia at the time. After modest beginnings, the left-wing group rose to prominence through the 1980s and 1990s as its association with the drugs trade improved its financial standing. At its peak it was the largest and best-equipped guerrilla force in Latin America. During half a century of conflict between Farc and the authorities, eight million people died, disappeared or were displaced. The 2016 peace deal, reached after years of negotiations, resulted in about 7,000 ex-fighters laying down their weapons.